New additions will always be on top and if the page gets too long, we will cut off a part of it and archive it. This url will always be the one to follow (last updates). New map from yesterday evening based on Satellite imagery and Published by the emergency entity of copernicus.eu. The map shows still an active but less intense eruption. Brand new map from yesterday evening based on Satellite imagery and Published by the emergency entity of copernicus.eu. Also to our surprise we acknowledge that the eruption is still going (at reduced rate), but that the lava is following a totally other less destructive path (West of the Crater). The flow is still present towards Portela and Bangaeira, but is channeled though a narrow lava tube and has only a minimal impact on these villages. If the eruption continues as it is now, the Mosteiras (downhill Bangaeira) does not have to fear any destruction. About 10 to 15 houses from a small settlement called Ilhéu de Losna are now in a potentially dangerous area. They are build at the base of the rim. December 23, 15:48 UTC (Armand): The eruption has not ended yet and the lava continues his way to lower valleys and settlements luckily at a lesser flow and speed. The situation this morning is the the small settlement of Ilhéu de Losna has been destroyed completely. Only 1 house which has been build up a hill survived the lava flow. After a relatively long silence MuzikaTV have published another video. They have used a drone to show the recent lava fields. Overlooking the flow, which is still red glowing at some points, we have to conclude that the destroyed villages of Portela and Bangaeira had really bad luck. The eruption is still ongoing but at a very reduced level. Below the latest detailed Copernicus map with the lava flows until December 16. The eruption is ongoing and filling up more areas. Mainly relief funding collections in the Fogo media. More and more help gets in but surprisingly mainly from African states (like Angola) and from the earlier colonization country Portugal. Probably more is coming in but this is what we read. Inhabitants from villages close to the volcano (Tinteiro and Cova Matinho) are reporting that the Volcanic Earthquakes are continuing and that some of these houses have been damaged by the earthquakes. The authorities are denying this but do admit at the same time that cracks in the ceiling do appear. For ER this is earthquake damage as well. CultureVolcan mentions that based on satellite pictures, 2 lava rivers are still active. Almost no news from Fogo means great news for the island. The lava flow is still active, but is hardly moving forward. No reason to evacuate more people at this time. Photos of the damage caused by the lava flows in Portela and Bangaeira released by the Asociación Canaria de Volcanología. And yet another impressive Photovolcanica video from Richard Roscoe showing the fogo eruption at night at his best. Enjoy! Wow what a new superlative lava video from Dr Richard Roscoe (www. photovolcanica.com). 2 minutes 54 seconds of lava action and certainly one of the best video's published so far. Richard wrote : After crossing tremendously hot lava deposits it was possible for a short time to get really close to the lava flows of Fogo volcano near their source where they are at their hottest and most fluid. The ground was so hot that the soles of my shoes were smelling of burning rubber and the feet of my tripod melted. Further downstream, the flows sadly destroyed the settlement of Portela. * The Chã das Caldeiras area has been evacuated following the eruption of Pico Fogo Volcano on 23 November and access restricted since 7 December by Civil Protection authorities due to increased volcanic activity and increased concentration of SO2 and CO2 gases. * Updated figures indicate that 1080 persons have been displaced and are currently housed in temporary accommodation centres, shelter units built after the 1995 eruption, and with host families. * Local authorities are working on a contingency plan for the possible evacuation of Cutelo Alto and Fonsaco areas. According to analysis provided by the local scientific community and international experts in Fogo, if the lava flow reaches Fernão Gomes, it may descend the north-east side of the volcano. An additional 2109 people would in this scenario need to be evacuated and require temporary accommodation and assistance. Presently, in the worst case scenario, at the decreased current flow rate, the lava would reach the area of Fernão Gomes within 7 to 10 days, according to experts. * As a preventive measure, the Civil Protection has identified the area surrounding the football stadium in Mosteiros as a location where 20 tents sent by the Civil Protection in Praia to Fogo could be set up, should there be a need to host displaced people in the worst case scenario. About 60% of the 2109 persons have accommodation with host families and have started evacuation of their belongings spontaneously. There is no official evacuation order. * According to reports from the Civil Protection, approximately 95% of the community of Portela and 70% of the community of Bangaeira has been destroyed. * About 450 hectares of land have been destroyed, including about 120 hectares of various crops. Crops have been lost and livestock also perished. * Volcanic activity continues, although no immediate threat to human health is reported. * Humanitarian assistance is ongoing. Displacement will continue for a period of time to be determined as conditions in Chã das Caldeiras are not safe for return. A short but great video from Marc Szeglat recorded during the first days of December. An American? organization? started a Fund-raising campaign for the affected Fogo people. They set a goal of 500,000 US$ and have collected so far 27,500 $. The campaign looks legitimate and we ask our Cabo Verde readers to tell us immediately if it isn't. Why are we saying this. Although the goal is well aligned, the responsible persons behind it are a) not specified and b) we have no address at all of the organization who promises to give the money. We say this mainly because we have the experience that after major disasters fake fund-raising campaigns are getting a lot of money. It's a business like another it appears :). "We've launched a new website that explains a great deal more of what the Fogo Fund is about and how we plan to help the people of Cha and Mosteiros. I'm hoping you can take a look at www.fogofund.org and learn more about my wife, Linda, and myself, and why we are raising these funds. If you agree with what we're doing, we would very much appreciate an updated post on Earthquake Report. - The greater caldera area is still no-go and guarded by the police and military. The main reason are the dangerous toxic gases. Why have we heard so little about the devastating Cape Verde volcano (in the International press) ? Around 60 volcanoes erupt in the average year. On any particular day, there are usually about 20 volcanoes erupting somewhere in the world. Naturally, they can’t all make headlines. But when there are human tragedies involved, we need to question the priorities of the news media. Contrast the fuss about eruption warnings in Iceland with the vanishingly low media profile of the current eruption on Fogo, one of the islands in the Cape Verde archipelago off the coast of West Africa. In Iceland, great fears of an ash cloud eruption that could down or ground aircraft subsided as the magma broke surface beyond the ice and fed a large and spectacular but pretty harmless fissure eruption across a remote and uninhabited region. On the other hand, since Fogo’s eruption began on November 23 it has so far destroyed two villages and the homes of more than 1,000 people. Below the Copernicus map with the lave flows seen by satellites on December 9. The map below has been published 20 hours ago and shows the situation of the lava flow front on December 8. Colors refer to different dates of the lave flow. The lava flow seems to have decreased considerably nut nevertheless people living in lower settlements have started to move their belongings into safer places. Fogo volcano eruption update from @involcan: Yesterday's Sulphur Dioxide output at Fogo was 9000 Tons/Day aprox. System still very active. In honor to the scientists working at the field and making sure nobody is getting hurt during this tragedy. Fogonews, whom we will especially thank for their continuous following of the eruption, has labeled them "science". They are of course in Portuguese, but if you understand Spanish, you will understand large parts of it. In between the interviews you will see some not yet published material. INGT (Cabo Verde) and Involcan (Canary Islands) are working together on this eruption. The Cabo Verde Government is increasing the Value Added Tax (VAT) on most goods and services from 15% to 15.5% to help the displaced residents. This will become effective in 2015 and aims to help rebuild the devastated villages, repair infrastructure, and aid economic activities on Fogo Island. The Asociación Canaria de Volcanología has posted a map showing possible lava flow directions and areas affected. The red areas are those already affected by the flow and the yellow areas are the possible flow routes for the near future. The thicker lines represent a higher likelihood of the lava traveling along that path. This page is brand new as Janine and myself decided that the Fogo volcano should have a page from its own, just like we did it for our El Hierro reporting. If the page gets too long, an archived part will be made and the link to it will be at the bottom of this page. We invite our users to assist us in gathering information whatever this information can be. This page should best be kept open in a browser tab as it will refresh every 30 minutes. 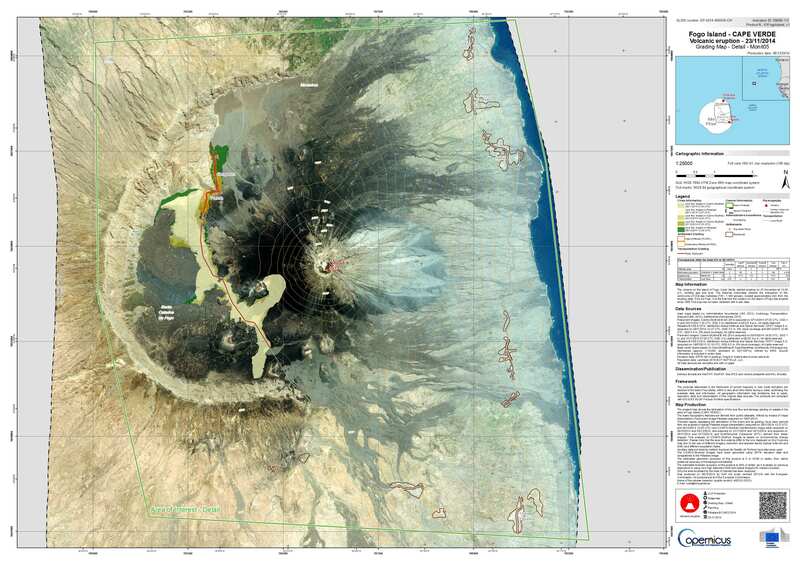 The below two maps posted by the Asociación Canaria de Volcanología shows the progression of the lava flows (the lava flow is NOT the red colored but the pastel colors). Lava flow extent on Dec 1. Courtesy of Asociación Canaria de Volcanología. The Prime Minister of Cabo Verde will publish an order to evacuate new areas on the island due to what he says is "increased (lava flow) activity" of the volcano. Almost the whole volcano caldera is being blocked by the military as nobody may enter it except geologists and volcanologists, a decision the population does not agree. More and more people are criticizing the authorities for the way they are handling the evacuation. It is feared that due to the steeper slope and the flood increase speed some locations as Tinteira (municipality of Santa Catarina), Relva, Achada Grande and other nearby locations in the county of the Mosteira may be endangered. Geologist Sonia Silva of the University of Cape Verde said that at present it is impossible to make predictions as to whether the lava in its descent of the volcano and before eventually reaching the sea will hit Monte Velha or places like Tinteira, Relva, Achada Grande and Corvo all located in the northeast of the island. Current situation : The lava is still flowing strongly and is on his way to Ferdinand Gomez (Fernão Gomes). Some houses in Bangaeira have been spared because they were build against some higher part of the hill. The slow front is now narrower than yesterday and goes downhill in 2 different narrower fingers. Dramatic image from Portela. The village currrently being engulfed is Bangaoeira. After that, and if the eruption goes on like it is now, the topography of the crater will lead the lava to the Ocean, but that will take many days. No other villages on his path for some time. After destroying Portela, the lava has now reached Bangaeira. Bangaeira is the village downslope Portela. Bangaeira has been build against the same slope. How far the magma will continue is unsure. The good news is that the distance to another village is very far. May we ask the International Media why they are not covering this dramatic eruption. 2 villages are being completely destroyed and the world doesn't know anything. These people should be helped asap and housing should be constructed. Cabo Verde is a developing country and will have a hard time to pay for the expenses. An idea : charge 50$ to every Tourist departing from Cabo Verde Sal to support the communities of Portela and Bangaeira. This Fogo News video (in Portuguese) was broad-casted an hour aga and describes the destruction in Bangaeira. The volcano footage which goes with the discussion of the anchorwoman with the reporter is the same as the video below, which is the reason why we haven't embed it. According to news articles the eruption from Fogo's Pico cone inside the Cha Caldera continued during 26 November-2 December. In the morning of 30 November the eruption intensified; lava travelled at a rate of 20 m/hour and caused the closure of the only alternative route between the national park and Portela, the main town in the caldera. Authorities warned all residents in the caldera to evacuate. Lava destroyed almost 25 homes, a large area of agricultural land, the Parque Natural do Fogo museum, and other infrastructure. By 2 December there were two lava fronts. After about 24 hours of minimal advancement, the rate of advancement increased; lava overtook several more houses, a school, and a hotel. @CultureVolcan reports that the Fogo eruption has strongly decreased and that the destructive flow has (maybe temporarily) stopped. This means, at least for now, great news for the Portela inhabitants who's houses have survived the current flow. The eruption at Fogo is Strombolian, which means short lived strong eruptions. It must be tragic to watch your house be engulfed by the slowly moving magma. So far, all efforts to deviate an AA lava flow have been unsuccessful. The lava makes concrete crumble like paper. The lava flow did not spare the school, the hotel and many houses. Today being the worst of the 10 ten days from the start of the eruption. So far 57 houses (37 today only) were destroyed, 51 tanks and about 30 hectares of land have been consumed by the lava. ESA Radar images from the Sentinel-1A satellite are helping to monitor ground movements of the recently erupted Fogo volcano. Located on Cape Verde’s Fogo island, the volcano erupted on 23 November for the first time in 19 years and has been active ever since. Lava flows are threatening nearby villages, and local residents have been evacuated. Radar scans from the Sentinel-1A satellite are being used to study the volcano. The image above – an ‘interferogram’ – is a combination of two radar images from 3 November and 27 November, before and during the eruption. Deformation on the ground causes changes in radar signals that appear as the rainbow-coloured patterns. Dramatic scenes this morning as more and more houses are eaten up by the cruel AA lava flow. The video below has been captured only a few minutes ago. MODIS (on the Aqua satellite) image of Fogo volcano, Cape Verde, showing gas plume (faint blue-grey streak) acquired on Nov 29. When Pico do Fogo erupted on 23 November the first indication from a satellite came from SEVIRI on Meteosat-10 at 11:30 UTC. SO2 was detected from SEVIRI, and also AIRS on NASA's Aqua satellite, with an initial estimate of around 14 kilotonne (kt). Harsh conditions at the FOGO volcano. The INVOLCAN team is forced to wear masks to protect themselves. Involcan also reports that the eruption becomes more explosive with lots of ash being ejected. 3 houses have been destroyed by the Lava Flow last night alone. The images below are showing the extend of the current lava flow. Thanks for this comprehensive site. I followed it for quite some time, having been in Cha das Caledeiras just two weeks before the eruption, and having seen it from the island of Santiago later.